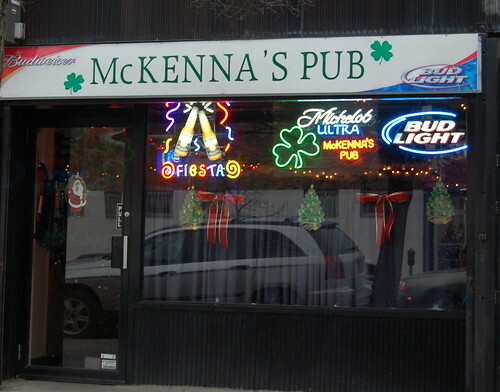 McKennas (2943 Avenue S) is a local pub on Avenue S (by Buckleys) was robbed last night. Coming in our tip line: Three black males came in robbed the bar and assaulted some regular customers. Its believed that they cased the bar a few days earlier and hit the bar last night. That’s unblieveable, I hope nobody was hurt. Does anyone know who was bartending last night?? I wonder that when they catch these animals if they are going to give their father’s job description or where they live or what kind of a neighborhood they live in? I even wonder if they will mention if they are black? They usually just give their height and weight and what they are wearing. offramp, if they needed the money more, stay in school, get an education, get a job and don’t rob from people who work for a living. Check out the TV shows where they show armed robberies, about 2% of the robber (animals) are white, guess what color the other 98% are. It’s not racism, this shows it is clearly a fact. I think offramp was being sarcastic. At least I hope…. 7 months, (almost to the day) later Mckenna’s (now Charles’s Ale House) got robbed just this past Friday night. 2 black guy’s this time. But same ones as the first robbery. I was working their the first time it happened. Nobody was caught the first time, and i am sure they won’t get caught again this time, and will probably hit the bar again in another few months. Thank god no one was hurt!!! It is a disgusting shame that you aren’t safe ANYWHERE these days. Does anyone know where Colm & Phyllis Meehan are? I see the pub was sold and I can’t reach them by phone. We are old friends and would like to get in touch with them.